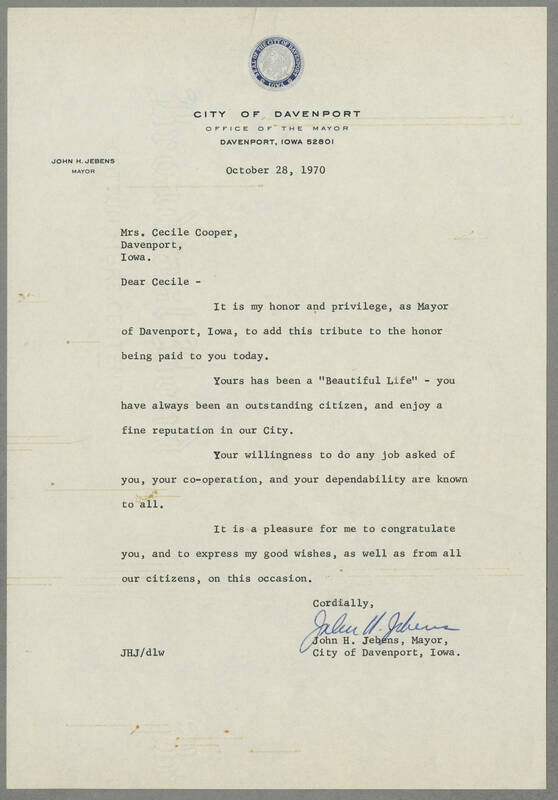 CITY OF DAVENPORT OFFICE OF THE MAYOR DAVENPORT, IOWA 52801 October 28, 1970 John H. Jebens Mayor Mrs. Cecile Cooper, Davenport, Iowa. Dear Cecile - It is my honor and privilege, as Mayor of Davenport, Iowa, to add this tribute to the honor being paid to you today. Yours has been a “Beautiful Life” - you have always been an outstanding citizen, and enjoy a fine reputation in our City. Your willingness to do any job asked of you, your co-operation, and your dependability are known to all. It is a pleasure for me to congratulate you, ans to express my good wishes, as well as from all our citizens, on this occasion. Cordially, John H. Jebens John H. Jebens, Mayor, JHJ/d1w	City of Davenport, Iowa.